So, in 2015 my resolutions were all things I thought I’d have a good shot at keeping that would improve my blog/life in small ways – and what do you know, I mostly did them. All bar that pesky ‘master basic sewing’ one. After one botched hem attempt and deep puncture wound it became very clear that YouTube alone could not teach me the fine art (I’ll need to do actual lessons one day to avoid stitching myself to something). Anyway, I did start writing a similar list for this year and then I realised that actually, I’m generally happy with where I am at the moment and don’t want to make many changes. So, this year I’ve decided to instead set the goal of having a monthly fun ‘experience’ that I maybe wouldn’t have otherwise had. And unlike an unrealistic resolution that requires me to magically master a skill I have zero talent at, I might have a shot at actually doing it! February we haven’t quite figured out yet. It’s my least favourite month of the year though – it’s the coldest it gets, work is always manic and it feels like it goes on forever even though it’s the shortest month of the darn year. Of course, I could propose on the 29th… (B is hopeful I’m joking about this, to which I say, ‘if you like it then…’). How’s that for an ‘experience’ – although not sure it’d qualify as ‘fun’? Joking (or not joking) aside, I’m half thinking I should do something around Pancake Day, as that’s, conversely, one of my favourite days of the year. I’m suddenly realising most of my ‘experiences’ are going to be around food. I’m ok with that. March, on the other hand, we’ve already got sorted. My parents kindly gave B and I a fab gift of a two night hotel stay with afternoon tea thrown in as a Christmas present (told you food was a theme). We’ve already booked it up and will be heading for Harrogate (I’ve never been, but B assures me it’s nice) towards the end of the month. B’s birthday is also in this month, so I’m sure we’ll do something fun for that too and I’ve got one of my best friend’s hen dos, which I’m pretty much solely organising. Nailed it. April is also in the bag already, as B and I will be heading to Wales to stay with the lovely Porcelina and her husband! I already can’t wait (the picture below is of when we met for the first and so far only time in 2015). She’s promised us the full tourist experience, and for someone who hasn’t been to Wales for a very long time, this is extra exciting (I’m not counting December when I went for work and didn’t actually see daylight; long story). And it’s my friend’s wedding, but I can’t take the credit for that ‘experience’! Anyway, all this aside (and there’s lots more planning to do!) I do have one more goal, while we’re on the subject of de-prioritising acquiring yet more material goods. 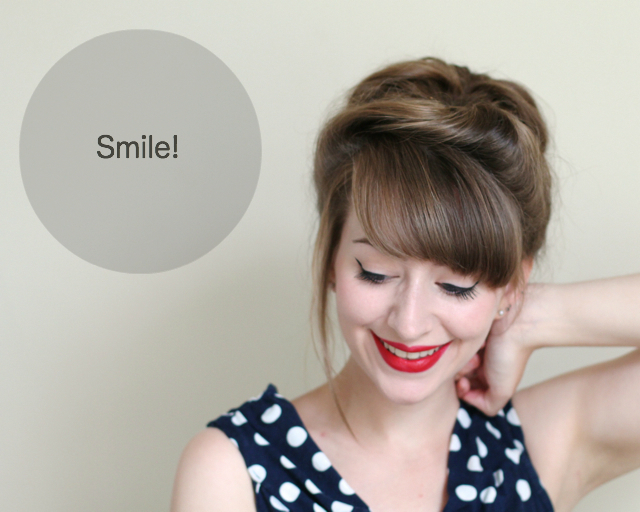 I’ve dreadfully neglected one accessory that I’ve had for years… I’m going to do my best to learn to love and use my smile! Previous Post Outfit: Happy New Year! This is a great idea! You will love harrogate, it's gorgeous, make sure you go to Betty's when your there, people travel from all over to go there for food or afternoon tea. Visiting Wales to see P is going to be amazing too, sounds like you have some fun food and traveling ahead! I'm rubish on ideas for 30th birthdays though, it's Harrys in March and so far I haven't thought of a thing! SO FUN! My boyfriend and I love to take classes and experience new places/things. I don't know if you have Groupon or Living Social where you live but I have found us some cool stuff on deal sites like that – for example: beer making class, glass blowing class, admission to an animal sanctuary to meet the animals, little getaways to local places for overnights, etc. Most of them are small but they're experiences and we love having day trips!! I've already turned 40! A workmate told me you should always do something you've always wanted to for a 'big' birthday, so for my 30th I dyed my hair pastel blue (not at all usual back in 2004; I got loads of abuse in the streets for it) and for my 40th we went to Burgh Island for a couple of days. You should deffo do something big for your 30th. Currently on my list of things I'd like to do are… stay at another Landmark Trust place; have cocktails at the Savoy; go back to Burma; visit San Francisco; do my family history trail in India; see more test matches (luffs me some cricket); eat at Duck & Waffle… think that's about it for now! I'll join you at the Savoy for cocktails Mim!! Interesting – my lot were mainly Calcutta, Chandernagore and Dacca, plus Burma. Though there don't seem to be any rellies left out there now. Where were yours based? This is such an exciting idea! I've also decided to try to spend more $ on experiences where I can actually wear my fab wardrobe rather than continue collecting. Truly I need to be living a celebrities life in order to wear all my wardrobe. I blame my love of vintage gowns on that. When I turned 30 (way back when…) I believe we did nothing and I got depressed. I've had a thing about not celebrating birthdays basically ever since I turned 24. I think I thought it might magically stop me aging past 24. Anyhow, this year I turn 50 and we are tentatively planning a trip to Africa and a safari. I've wanted to do that for years and I'm hoping this is the year we manage to pull it off. Exactly, why have all these amazing clothes if you gots nowhere to wear 'em! Oh, I so relate to this! I also tend to spend all my spare cash on clothes (and occasionally makeup),which means I never seem to have anything left over for fun stuff! I tend to do most of my shopping online, though, so a couple of months ago I decided to start taking some cash out of the bank as soon as I get paid, so it's out of temptation's way, and there to be spent on other stuff: I only managed to stick to it for one month, but it did make a big difference, so I should really do it again: clothes are all well and good, but it's nice to have somewhere to wear them, too! I'm like that with eating out too, I love homecooking though.. Max and I are trying to get into the habit again of going out and having a date out once a month, usually lunch and a movie or something else nice! Sounds like a great choice of experiences so far. You will love Harrogate, it is a lovely, pretty town. I would really recommend going to the Harrogate Turkish Baths. It has been restored from Victorian? times and is beautifully painted and tiled. There are 3 dry heat rooms which get progressively hotter, a sauna and a scream inducing plunge pool. You need a few hours and you probably need to book. They do treatments too. Also, go downstairs in Betty's as it has beautiful marquetry panelling or book for afternoon tea which is yummy. Near by is Harlow Carr, a big garden which might make a good back drop for photos! I would love to have a really cool suggestion, but I'm terrible about that kind of thing. My first thought is always to travel, but I don't know if that's an option for that month for you. I'm sure you'll figure something out, though, because the rest of the months you have planned so far sound awesome. Seriously, though, I have the hardest time convincing myself to spend money on things other than clothes. I was trying to avoid travel only because it would exclude my friends from being a part of it… we're getting closer to an idea now, but by no means decided! This is such an awesome way to recap one's year, breaking it down by monthly highlights. I might just have to follow your lead next year and try my hand at this approach, too. It's certainly giving me lots of things to look forward to, which at this time of year is no bad thing. LOL I know the dilemma of wanting to buy clothes vs spending money on anything else all too well! Your goal for 2016 is very worthy of trying to shop less though. I commend you on it and wish you lots of luck! Thank you, I need it! I'm not doing very well so far but the sales have been so good lately!! This is such a wonderful idea for a year! Many people forget their goal or resolution, but if you have a new thing to do each month, it's perfect for keeping the year great and exciting. And it looks like you've got many great things lined up! Also you have a fabulous smile! I have a very hard time using mine (its crooked) but it's definitely a goal to smile more, and a good one at that!